The technical possibilities and developments have also come a long way in the horticultural industry in the past years and this is still changing every day. For our nursery, this means that each year we examine what latest development fits with our operations, after which we examine the investment opportunities. 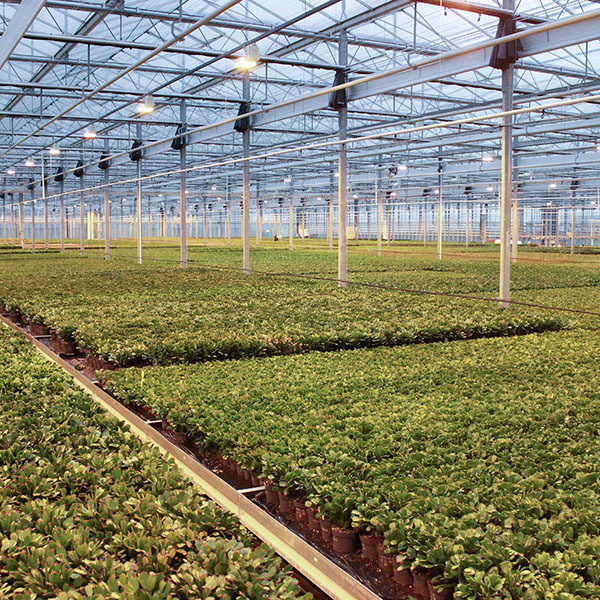 In 2006, a major step was made in our nursery: a new greenhouse was built with external screens, a modern lighting installation, climate control, misting installation and automated shades. A growing container system was also installed this year. Our plants are placed on these growing containers that, with the help of a ‘train’, can be transported throughout the entire greenhouse. In this way, our colleagues can work at a central work area situated at the front of our nursery because the growing containers are brought to this work area by this ‘train’. 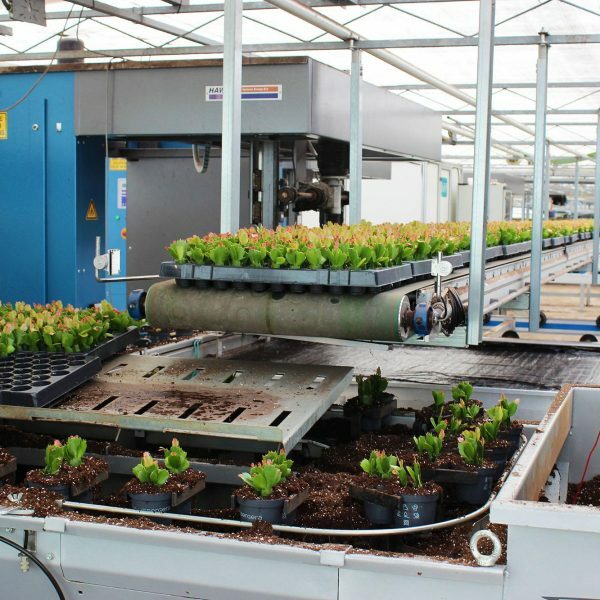 In the work area, there are three robots that, during potting, sorting and spacing the plants further apart, automatically gather the plants from the growing containers, or place them in them. 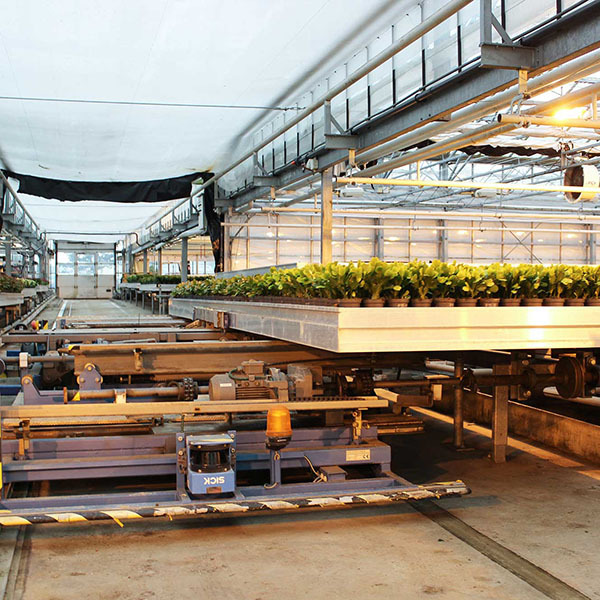 While the plants are being spaced further apart, a camera-based sorting system is used to grade the plants according to size and quality. In our sales department, we make use of a sales buffer system. 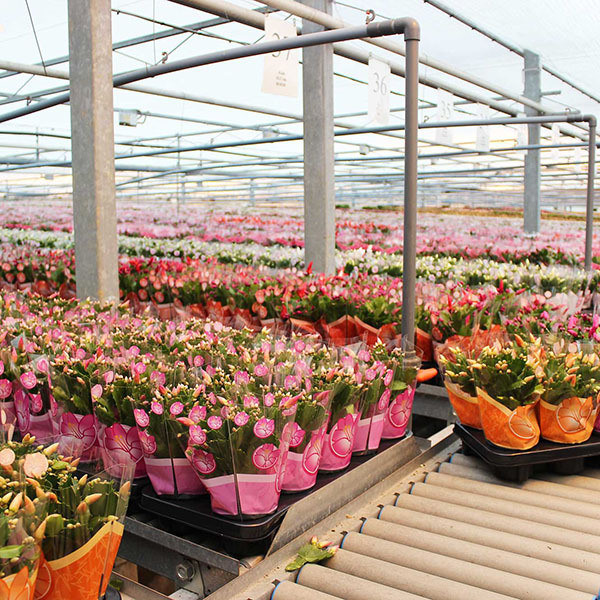 The plants are sorted manually by our colleagues based on quality and colour, after which the sorted plants are placed on a conveyor so that they arrive in the sales buffer sorted by colour and by pot size. In this way, we can custom prepare our customers’ orders: by colour or mixed, with a sticker on the pot or on the sleeve, printed or blank sleeve, with a glass or ceramic pot and in any desired container.